While dogs and cats are subject to both food and inhalant allergies, there is one allergy that affects them more than any other. If you haven't guessed, it's fleas. By far the most common skin disease for pets, flea allergic dermatitis is caused by a hypersensitivity to flea saliva and it can strike pets of any age. Adult fleas have the ability to bite, but it's actually the life cycle of the flea that poses the bigger issue. Once the adult flea lays its eggs, it generally detaches itself from the host. The eggs that are left behind then mutate through the rest of their lifecycle. Unless the infestation is treated on a comprehensive level, the process continues on and your pet will see no relief. Itching and scratching are generally the first symptoms a pet owner will notice. If left untreated, symptoms can progress to hair loss, scabbing, and sneezing. In a worst-case scenario, fleas can actually transmit both viral and bacterial diseases. No matter if your pet lives indoors or outdoors, fleas can be a problem. In addition being aware of the aforementioned symptoms, we recommend regularly checking your pet for any visible signs of fleas. By using a flea comb that can be purchased at any pet store, fleas and their waste can be easily seen. If your pet has symptoms but no fleas are found, it could be a sign of mites or a bacterial disease, and may require a skin test performed by a veterinarian. Typically, a flea management product will be used to control your pet's flea infestation, as well as to prevent further infestations. We use Trifexis for dogs, a chewable pill that takes care of fleas, heartworms, and intestinal parasites. For cats, we use Revolution, a liquid that is applied to the back of the neck. Flea infestations are more prevalent during certain times of the year, but we recommend year-round treatment. In terms of your pet's skin, advanced cases of dermatitis may get treated with medication, administered either orally or by injection. No matter if your pet is a puppy or kitten, an adult pet, or a senior pet, he or she is vulnerable to flea infestation. 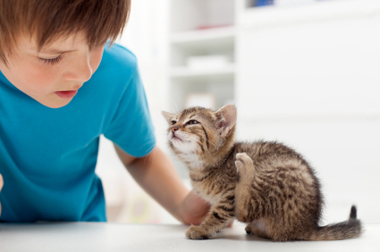 For more information about treating fleas or other pet allergies, feel free to contact us today.